Talk about workouts, healthy foods and more here.. This is a great way to get rid of underarm flab. 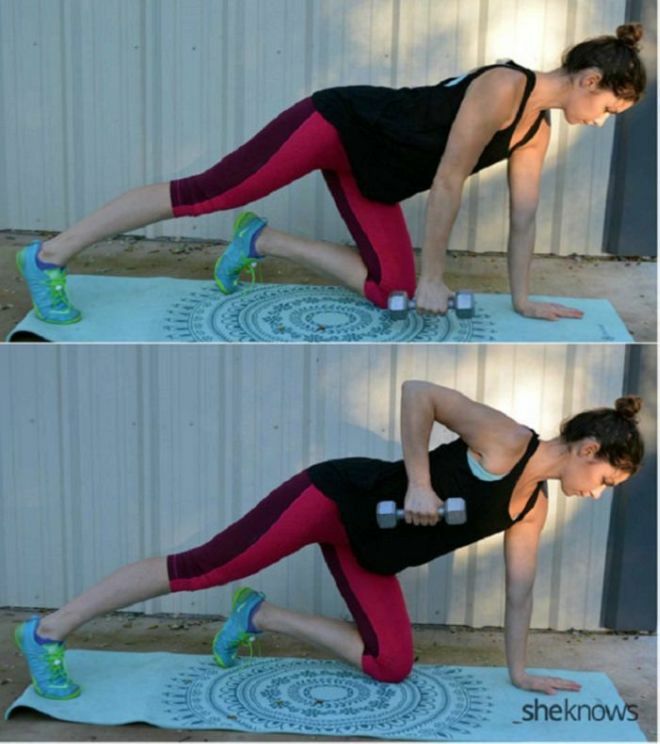 Start by standing on all fours, with a weight in one arm. Hold the weight in your right hand, stretch your right leg backward, touching the floor with your toes, and keep your weight on your left leg. Also, place the toes on your left foot on the floor. Now, lift your right hand up by bending your arm making sure the weight reaches the chest area, as shown in the lower picture. Then, put your hand back toward the surface making sure the knee doesn’t touch the ground. Perform two sets of 15-12 repetitions per hand (4 times total). After one set, rest for 45 seconds at most, and continue to the next set. After a few exercises are done, you can make 3 sets of 15 repetitions. 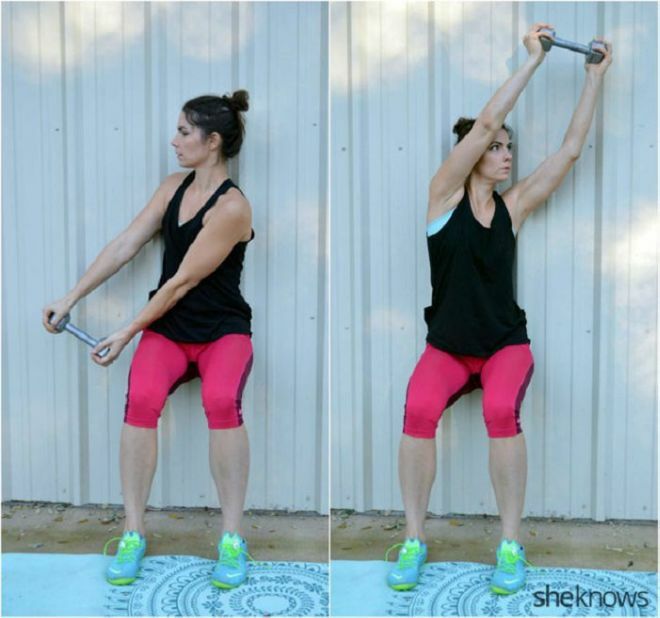 This exercise will strengthen your shoulder muscles, which will make it easier for you to lift things. 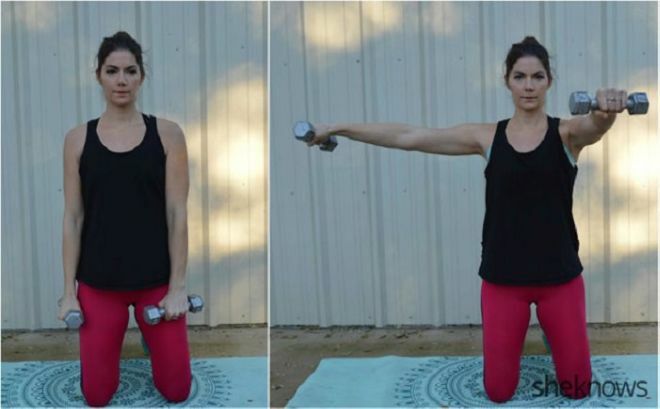 You can perform this exercise by standing or kneeling (as shown in the pictures),. Hold a weight in each hand, with your left hand on the side of your thigh and your right hand in front. Note that your palms are facing your body. Now, raise your hands to shoulder height, with your left hand raised forward and your right hand to the side, as shown in the picture. Then place your hands back in the initial position. Perform two sets of 10 to 12 reps on each side. Rest for 45 seconds between reps. This exercise will help you strengthen your shoulders and shoulder blades which will improve your posture significantly. Rest with your pelvis on the wall, with your feet hip-width apart, bend your knees until they form a 90-degree angle and keep your weight on your heels while holding one weight with both hands. Tilt your torso slightly to the right, including your head, and move your hands to the side, to the outside of the right thigh. Now, lift your arms diagonally toward the left side of the body, above your head, and look away to the left, keeping your pelvis in place. Then put your hands back in the initial position. Perform two sets of 12 repetitions on each side, starting one set to the right and the second set to the left (4 times in total). Rest for 45 seconds between sets.